A near-exact replica of the probe Europe will be sending to Mercury later this year has gone on show at London’s Science Museum. 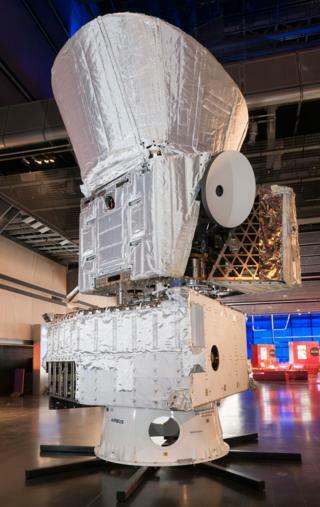 BepiColombo is due to blast off on a seven-year journey to the inner-most world on an Ariane rocket in October. Referred to as the Structural Thermal Model (STM), the object now on display in the Wellcome Wing was used to prove the fundamental design of the mission. Its different stacked parts stand over 6m in height. “If you leave aside the aeroplanes in our collection, this is one of the biggest objects we’ve ever had – certainly, one of the chunkiest,” said Doug Millard, the Science Museum’s space curator. Bepi is really three spacecraft in one. It actually contains two different probes – one built in Europe, the other in Japan – that will separate once the mission arrives at its destination. But the pair travel together from Earth, sitting atop a big propulsion module. This unit has the vital job of managing the long cruise to Mercury. 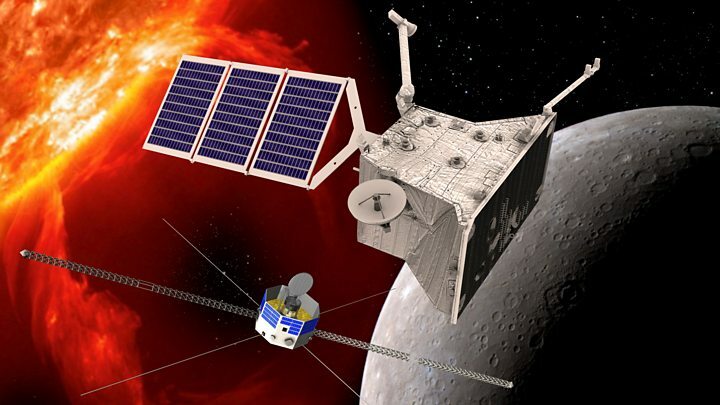 Four ion engines will brake Bepi’s fall into the deep gravity well of the Sun. “You could get to Mercury very quickly if you just careened down hill on your go-kart; you could get there in roughly three months,” explained Prof Mark McCaughrean, the European Space Agency’s senior science advisor. Along with the ion-engine braking, the gentle path to Mercury also involves doing a number of flybys of the planets, using the tug of their gravity to sap the probe’s speed. Assuming this all works, Bepi should arrive in orbit at the little planet, ready to begin its science, in 2025. The expectation, of course, is that everything will work out just fine. And that confidence is borne, in large part, from all the hard work that was done on the STM. A Structural Thermal Model is assembled ahead of the “real thing”. It is where you identify any mistakes or weaknesses in the design. “The STM is where you learn all your lessons, and any problems you encounter – you solve them on this model so that the flight model build goes really smoothly,” said Jess Marshall from Airbus, which led the industrial consortium that has produced Bepi. An STM is fabricated using the same materials as the eventual flight model, right down to its screws and glues. It will also contain representative electronics and even boxes to mimic a probe’s science instruments. The whole structure gets shaked and baked, and assaulted with sound, to simulate the conditions of launch and of operation in space. One of the major challenges for Bepi is heat and how to handle it. The real spacecraft will be toasted on one side by the Sun and on the other by the radiant heat coming up from the “hot potato” planet, where surface temperatures are high enough to melt some metals. Testing on the STM has shown the flight model will cope. Visitors to the Science Museum will get to see some of Bepi’s heat-resistant strategies, such as its white insulation blankets. The STM is set to become the focus of an education campaign, Mr Millard said. 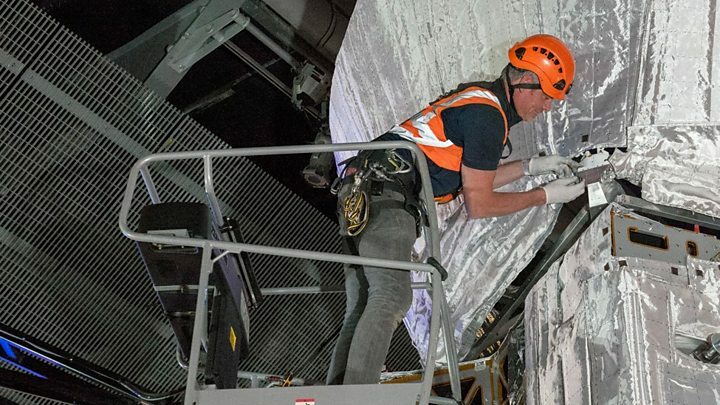 The real BepiColombo is currently in French Guiana where it is being prepared for its Ariane launch at the country’s spaceport.